My first public release of a map for Counter-Strike: Source! Well, I was excited. 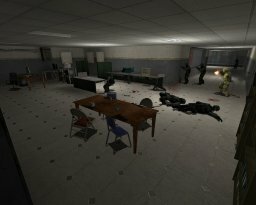 Counter-Terrorists: The Government has discovered a crashed UFO, and have transported parts of the crash site to a lab for analysis. You must protect the lab from smelly Terrorists! Terrorists: You must destroy the lab before they learn how to harness the Aliens' mind control powers! Blow up the parts or bring down the whole building, you decide. Thanks to everyone who's given me feedback and encouragement. Special thanks to the SLAKers for hosting an early version for playtesting. Includes edited bot nav file, with place names and some hints for the silly bots. 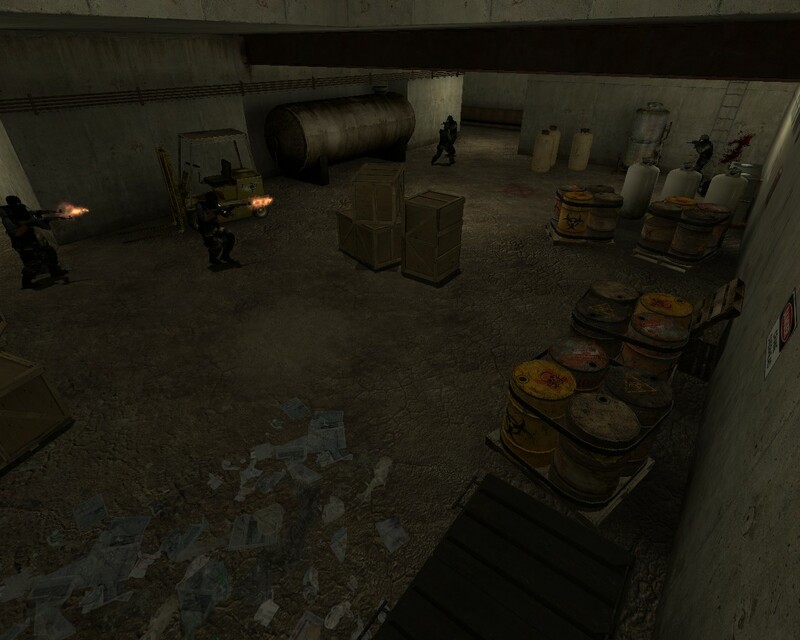 Unpack in your "...\Valve\Steam\SteamApps\[steam name]\counter-strike source\cstrike\maps" directory. I started working on this map back in June 2005. The first thing I did was look at the overall structure of the various de_* maps in the standard CS:S playlist. I sketched out some ideas on paper based around what I thought would be a good structure. This included major routes, alternative routes, sniper spots, first-meet spots, that sort of thing. I specifically wanted to go 3d, since that hadn't been done much (and not well, in my opinion). I then proceeded to test the layout. I tried teams of 5 and then 10 bots per side. I played with the teams, or let them play by themselves (with 20 bots, my machine isn't really playable ;). I'm coming from the "release early, release often" Open Source world, so I also released this version of the map into the wilds for feedback from others. 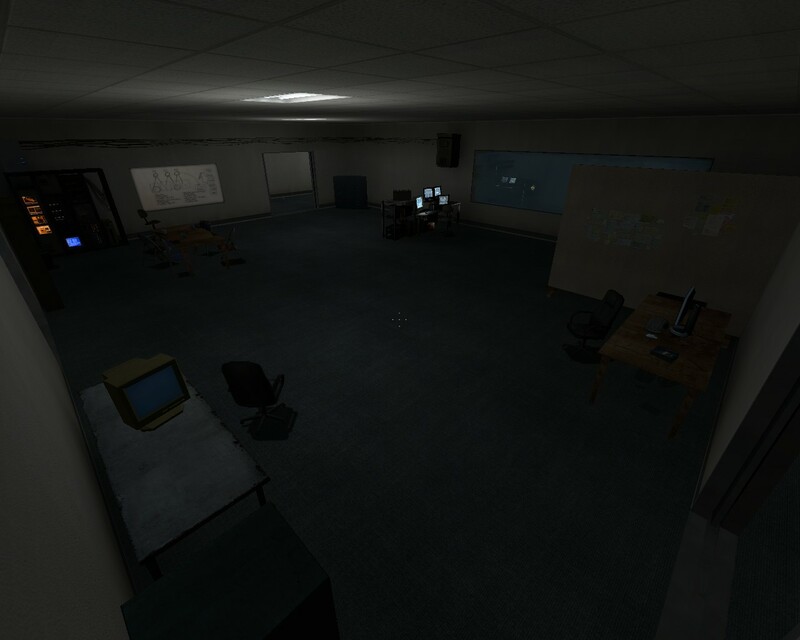 The feedback usually consisted of "sucky textures, man" but sometimes included comments about scale and playability, which was useful. You can download that version (157 KB), if you're curious. The map came out almost perfectly balanced -- matches over an hour typically came out with one side winning by 2-5 rounds. Feeling pretty good about the layout, I then started on the hard part - making the map cosmetically appealing. I quickly discovered that browsing for textures sucked. I now have a set of keywords that I know will get me a good set of textures to work with, but I also know that there's some textures that you simply have to browse the entire set to find. Searching by map name can also work. What's worse is finding models. 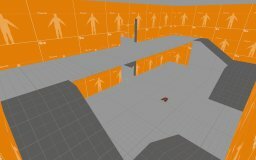 I discovered a post by a Valve employee who said that they typically create maps with just models in them. I did this, and the result was a "prop_zoo" map that contained all the lab/building/office type models that I might need. 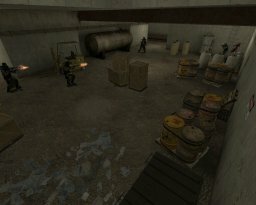 This took by far the longest amount of time during the creation of de_lab. A decent model browser, with the ability to search by keywords, would have negated any need for this. Sigh. I worked on another map for a couple of weeks. It didn't pan out. A couple of players gave me really good feedback. I was encouraged to work on it again. I started from scratch. I'd learnt a lot about how to create the base structure of a map so that it's easier to add detail later on. I spent more time planning the building so that detail would seem more natural. 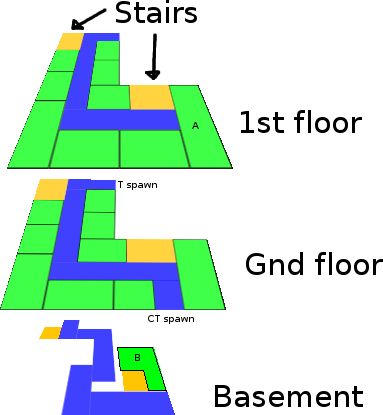 The basic gameplay of the map hadn't changed. 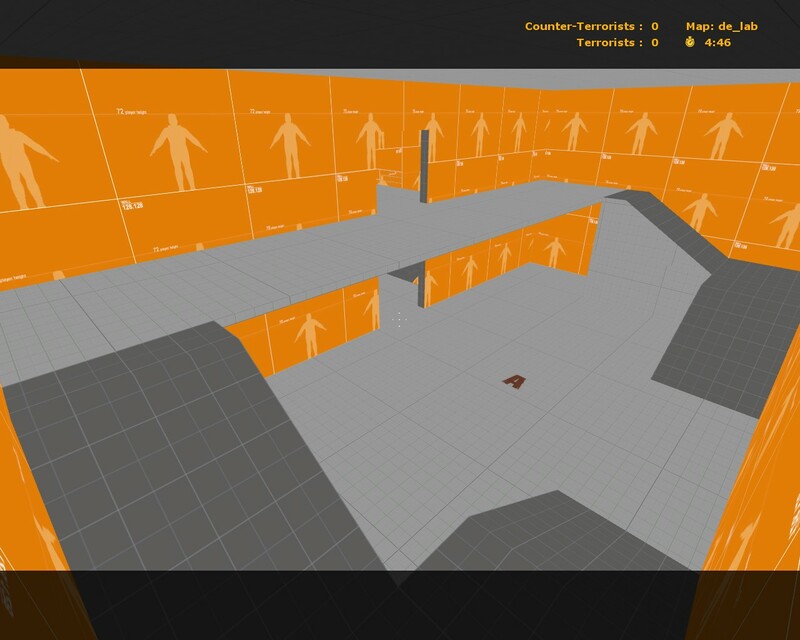 Again I tested it for hours with teams of bots and myself jumping in every now and then. Some notes about the false ceiling (originally I wrote this up as an email response to an inquiry). Very little of the stuff behind the ceiling is rendered - the top side (and the sides that aren't player-visible) are all textured in nodraw. The hallway behind the ceiling isn't, but that's just an oversight. 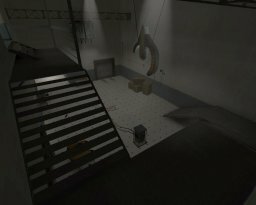 In my first iteration of the map (v7 is one of these) the lights were directly embedded in the hall ceiling, with the ceiling tile texture applied directly to the hall ceiling too. This turned out to be horribly messy though, because the lights are recessed. Made it very difficult to move them around since do to so I was changing fundamental building blocks. The hall (including false ceiling) is >128 units high. Unfortunately, the wall texture gets a strange seam when I cut the block there and have a second block which uses the "continuation" texture. You can see this in some places still, where I've not hidden it with props. The false ceiling therefore is just down from 128 units (126 I think) to cover this seam. Again, I had intended to go back and remove / nodraw the hall *above* the false ceiling, but never got around to it (I had also intended to have some missing panels). 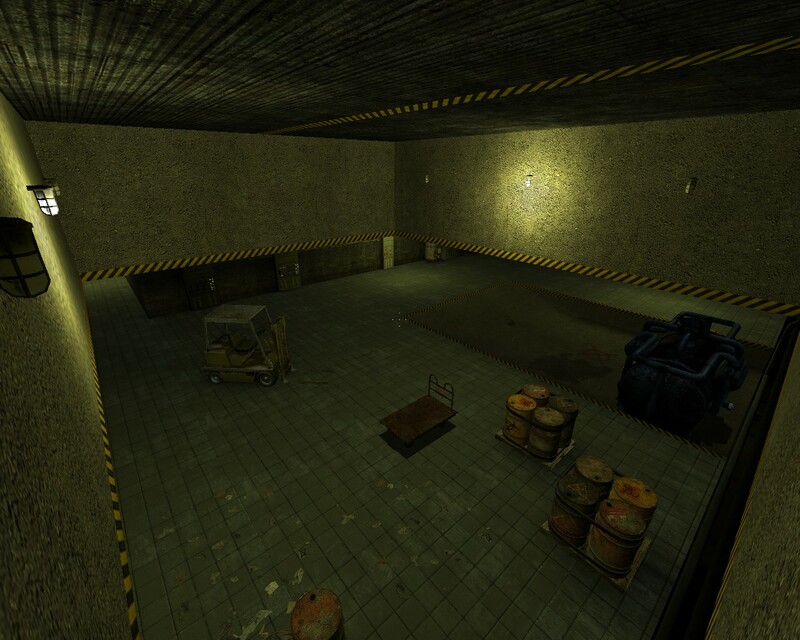 For the people who hung around right to the end of my rambling, a bonus: de_lab_v11_src.zip (237 KB), the map source. I retain full copyright. 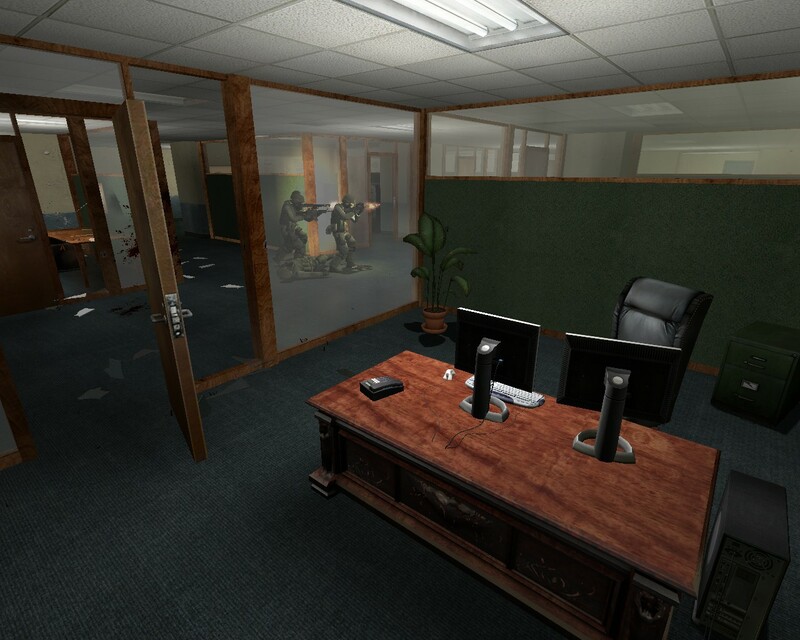 You may copy the map, make derivatives and use it in commercial works. I ask attribution (put my name in lights) and that you similarly release any derivatives under the same license. Contact me if you would like different licensing. See the page footer for more information. Comments? Feel free to drop a line at my weblog.